Climate change and youthful demographics can combine to create security risks in already fragile contexts, according to a new report commissioned by UNICEF UK and co-authored by the London-based research organizations International Alert and the International Institute for Strategic Studies. By 2050, when more extreme climate change impacts will be widely felt, global population is projected to reach 9.6 billion, up from the current 7.2 billion. The vast majority of this growth will take place in less developed countries, and much of it will take place in states that are currently fragile. Many countries with large youth populations are also predicted to be the most exposed to the impacts of climate change, yet have the lowest resilience and capacity to adapt to climate change. Nineteen of the twenty most at-risk countries to high levels of fragility, poverty, disasters, and vulnerability to climate change have median ages below 25. This is not a coincidence, but rather because both factors are a result of insufficient governance capacity and services provision, especially around health and education, the absence of which contributes to high fertility rates, large youth cohorts, and climate vulnerability. Large youth populations can provide a positive boost for growth and development under the right economic conditions – a phenomenon sometimes referred to as the “demographic dividend.” However, there is also a strong link between large youth cohorts and conflict risk. The specific conditions through which disproportionately large youth populations can pose a risk to security – lack of economic opportunities, inadequate governance, and poor services provision – can be exacerbated by the additional pressures which climate impacts will place on these factors. Similarly, the pathways between climate impacts and security consequences – such as poverty and unemployment, labor migration, and inadequate disaster response – can be reinforced if the needs of large numbers of youth are not met. When states are under economic strain, young people tend to be excluded. Climate impacts are likely to complicate economic growth and increase pressure on many livelihoods. Unstable political environments also impair economic performance and limit the state’s capacity to implement climate adaptation measures, further increasing vulnerability to climate impacts and conflict risks. If states remain unresponsive to the needs of young people and are perceived to be unable or unwilling to create the conditions for equality of opportunity, this can contribute to discontent and civil violence. In certain conditions, this can increase the risk of larger scale unrest or conflict. As a region, Africa faces the highest risk of these overlapping challenges, particularly sub-Saharan Africa, but they also factor in Central America, the Middle East (Yemen, Iraq, Palestine), and across countries in Asia (Afghanistan, Pakistan). Our report examines these dynamics through case studies in Egypt, Guatemala, Indonesia, and Kenya. In Egypt, for example, the current population of over 83 million is projected to increase by 50 percent to 120 million by 2050. Fifty-four percent of the population are under 24 today – half are between 15 and 29 and therefore in need of jobs. There is free higher education, but few opportunities to capitalize on it for most youth, as there are simply not enough high paying positions. Alongside a lack of political voice and sense of relative deprivation amongst many young people, this creates a high risk of political instability. Climatically, Egypt is vulnerable as well. Habitable land is already at a premium – 96 percent of the population live on approximately 6 percent of the land. Hotter temperatures, rising seas, and reduced water availability will severely affect land available for housing, as well as agriculture and the viability of related livelihoods required to feed and employ this population. The unrest which emanated from Cairo’s Tahrir Square in 2010-11 was in part triggered by demographic stressors such as overcrowding and under-servicing of urban centers. Most participants in the demonstrations were young, un- or under-employed, and disaffected. Without adequate attention to strengthening inclusive democratic institutions and promoting more equitable, climate-resilient economic growth that meets the needs of young people, these combined challenges in Egypt and elsewhere could have serious implications for the security environment. Creating sustainable economic growth that provides opportunities for young people and is resilient to future climate impacts may prove a challenge though, particularly for states with already weak governing capacities. Building economic and social capital to promote peace and stability will therefore be particularly relevant in countries that face concurrent demographic and climate risks. In the development space, tackling disaster risk reduction in a manner that is sensitive to political context provides opportunities to reduce long-term disruption to youth education, livelihoods, and wellbeing that can follow from disasters and potentially increase the risk of conflict. Both climate and demographic models are fairly accurate to mid-century – we can know what to expect to a large degree. Forward-looking policies that invest in education and secure employment opportunities and representation in governance should therefore be prioritized for those countries most vulnerable to avoid further marginalizing youth and instead maximize their potential to boost growth and development. Janani Vivekananda is the head of environment, climate change, and security at International Alert. Her interests include the implications of climate change policies on peace, the links between climate change and community resilience, and opportunities for positive responses to climate and environmental change and disasters. Sources: International Alert, International Institute for Strategic Studies, Overseas Development Institute, UNICEF, UN Population Division. 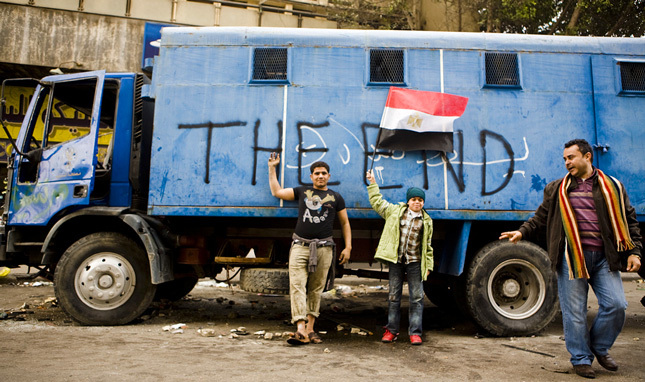 Photo Credit: A wrecked security forces truck in downtown Cairo, January 2011, courtesy of Hossam el-Hamalawy.